ON THIS DATE (October 5, 2003) ... The Red Sox staged their latest, and maybe greatest, comeback of their magical season to force a decisive Game 5 of the American League Division, as David Ortiz, down to the last strike in the eighth inning, launched a two-run double to lift the Sox to an electrifying 5-4 victory before a pandemonious 35,048 at Fenway Park. And it was staged by a team that has etched itself an indelible place in franchise lore. Showing the baseball world yet again why they rank among the most dangerous in the game, particularly when they seem to have all but lost their pulse, the Sox shook even the sturdiest souls in their own dugout with their latest miracle moment. 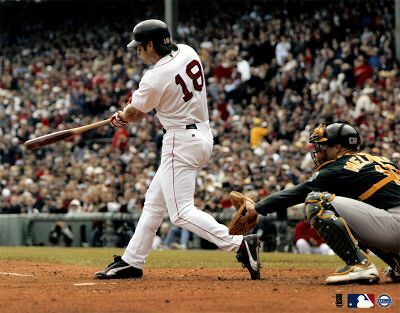 The day after Trot Nixon's dramatic walkoff shot clinched Game 3, the Sox pushed the A's to the brink of losing a potential clincher for the ninth straight time over the past four years by shocking supercloser Keith Foulke. The winning rally was particularly stunning since a couple of the key participants had struggled badly in the series, and in their careers against Foulke. With one out and the Sox trailing, 4-3, Nomar Garciaparra (2 for 11 in his career against Foulke) fell behind in the count, 1-2, before he cranked a 79-mile-per-hour slider off the Monster for a double. A batter later, Manny Ramirez (2 for 15 in the series and 1 for 11 in his career against Foulke) also was down to his last strike before he whistled a single through the hole to left, giving the Sox a chance to tie it. But as Garciaparra raced around third, left fielder Jose Guillen uncorked a strike to the plate, which came as little surprise to third base coach Mike Cubbage. 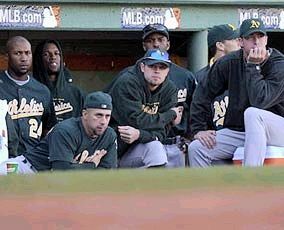 Garciaparra and Cubbage had conferred while the A's huddled on the mound after the double. Again, Foulke came within one strike of escaping the jam against Ortiz, who was 0 for 16 in the series. 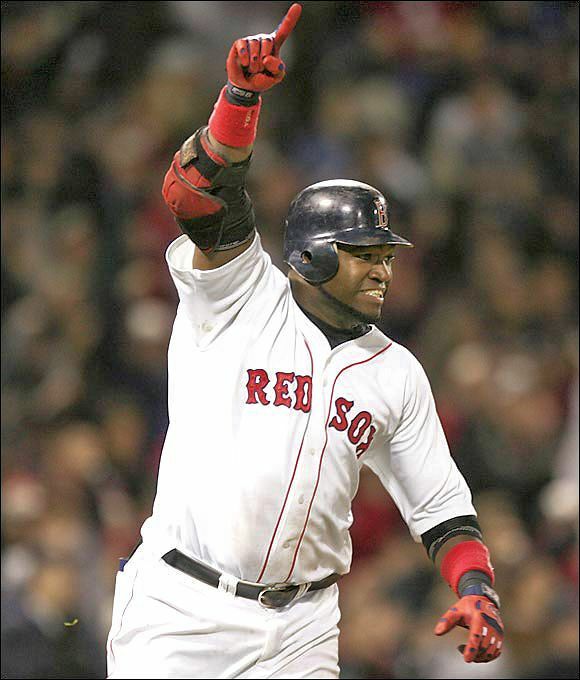 But as the foundation of the little bandbox on Yawkey Way all but shimmied from the force of the sellout crowd urging on the MVP candidate, Ortiz ripped a 91-m.p.h. fastball over right fielder Jermaine Dye. It caromed off the wall of the Oakland bullpen far enough for both Garciaparra and Ramirez to rumble home. And for Ortiz to answer some of the folks who have pointed fingers at him for his slow start in the postseason. With the 5-4 lead in hand, Scott Williamson did the rest, overpowering the A's in the ninth as he fanned two batters before he retired Erubiel Durazo on a weak popout, triggering a wild celebration to the triumphant beat of "Dirty Water." Williamson also mowed down the A's in order in the eighth after Tim Wakefield pitched 1 2/3 innings of scoreless relief for John Burkett. Long after the game was over, fans waited outside at the corner of Yawkey Way and Van Ness Street while the Sox packed and got on a bus bound for Logan and the flight to California. It was the conclusion of one of the best sports weekends in the long history of our town and if the Red Sox win tonight they'll be back next weekend to play the Yankees for the right to go to the World Series.